There’s a mole in the house: only a few days after the leaks about the Moto G7 series, a new set of leaked renders now show the so-called Motorola P40 smartphone. 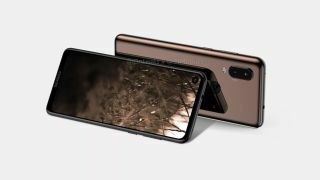 It is said to be the successor to the Motorola P30, and we’ve got some specs as well as some photos via 91mobiles. The renders indicate a new direction in Motorola’s design aesthetic, as the company adopts the display hole front camera feature. We’ve seen that on several recent devices from brands like Samsung, Honor, and Huawei, and it looks like Motorola might be going the same way. The pictures have the selfie camera as a hole on the top left of the 6.2-inch display; camera details are currently unavailable. The display has uniform bezels on the sides and the top, and is relatively thicker at the bottom. The back panel is highly reflective in the renders, indicating that it might be made of glass. It features a slightly protruding dual camera setup- one sensor is reportedly 48MP, while the other one is still unknown. Below the rear camera is a dual LED flash, and the fingerprint scanner appears built into the Motorola logo at the centre. The Android One logo can also be seen at the back of the P40, near the bottom. Ergo, the phone is part of the Android One programme, and will therefore receive security and software updates in a timely manner. The renders show the SIM tray to be on the left, the power and volume buttons on the right, and a USB Type-C port at the bottom on the phone, along with a microphone hole and a speaker grille. The device also has the traditional 3.5mm headphone jack at the top. The phone’s dimensions, according to the report, are 160.1x71.2x8.7mm.